Order up one of our famous breakfast sandwiches on a freshly baked bagel (as seen on CBS morning news). Your egg sandwiches are made to order. Grill is open from 6 a.m to 1:30 p.m. daily. We are open 7 days a week. 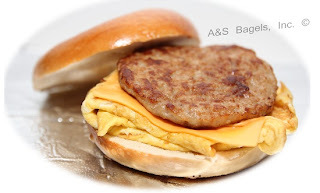 The A&S Bagels retail store is located at 761 Hempstead Turnpike, Franklin Square, New York 11010. The French Toast Bagel has been gaining poularity among bagel lovers in recent years. In the past, bagel flavors such as blueberry and french toast were frowned upon by bagel purists. However, times have changed, and these sweet tasting bagels are leading the charge. A&S French Toast Bagels were featured on Fox 5 News by reporter Vanessa Alfano. One great way of having our French Toast bagels is with butter and maple syrup. A&S Bagels makes and bakes fresh danish daily. Pictured above is an apple turnover from A&S Bagels. Stop in today, and try one today. A&S Bagels is open 24 hours a day, 7 days a week, and is located at 761 Hempstead Turnpike, Franklin Square, New York 11010. 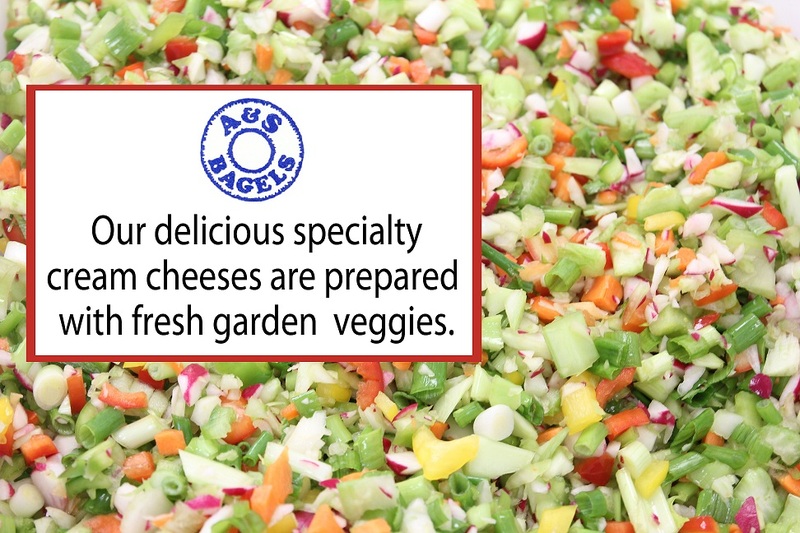 A&S Bagels fresh made Veggie Cream Cheese is available at the A&S Bagels retail store located in Franklin Square, New York. The A&S Bagels retail store is open 24 hours a day, 7 days a week. The address of the store is 761 Hempstead Turnpike, Franklin Square, New York. 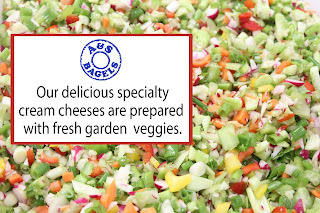 Please visit our store and enjoy our garden veggie cream cheese on one of our fresh baked bagels. A&S Bagels Cream Cheese Flavors include: Garden Veggie Cream Cheese, Lox Spread, Strawberry Cream Cheese, Scallion Cream Cheese, Olive Cream Cheese, Cinnamon Raisin Walnut Cream Cheese, Chocolate Chip Cream Cheese. All spreads are made fresh, and can be purchased by the lb. The images pictured above was photographed by Rosanna Talarico. All the pictures, images and content of this web blog are copyrighted and/or owned by A&S Bagels, Inc and/or A&S Bagels has permission for use. No use, or reproduction of any pictures, images or content appearing on this web-site is permitted without the express written permission of A&S Bagels, Inc. 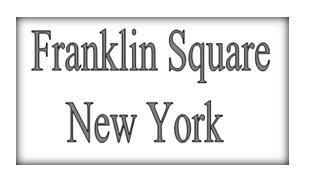 I purchased this book and was captivated by the images of Franklin Square, New York. The book is jam packed with images, and each image tells a story. I highly recommend this book to any resident of Franklin Square (past or present), history buff or nostalgia fan. 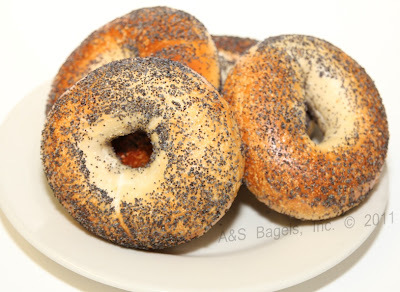 Pictured above are poppy seeded Bagels from A&S Bagels. Poppy seeds are a classic topping for bagels. Poppy seeds are used as an ingredient in various other foods, for example: Lemon Poppy Seeded Mufins, Poppy Seed Salad Dressing, Grain Pudding (Kutia). The poppy seeded bagel is a bagel store staple as is the plain bagel, sesame seeded bagel and onion bagel. A&S Bagels bakes poppy seeded bagels throughout the day and night. A&S Bagels is a bagel bakery serving wholesale and retail customers authentic New York bagels, bialys, rolls, danish, muffins, black and white cookies and more. The A&S Bagels store has recieved media attention, for example, the Z100 radio morning show (100.3 FM) chose A&S Bagels as Long Island's Best Bagel. A&S Bagels were also featured on the CBS morning television news, Fox 5 TV, and have been mentioned on the Howard Stern Radio Show and on Hofstra University Radio (88.7 FM). 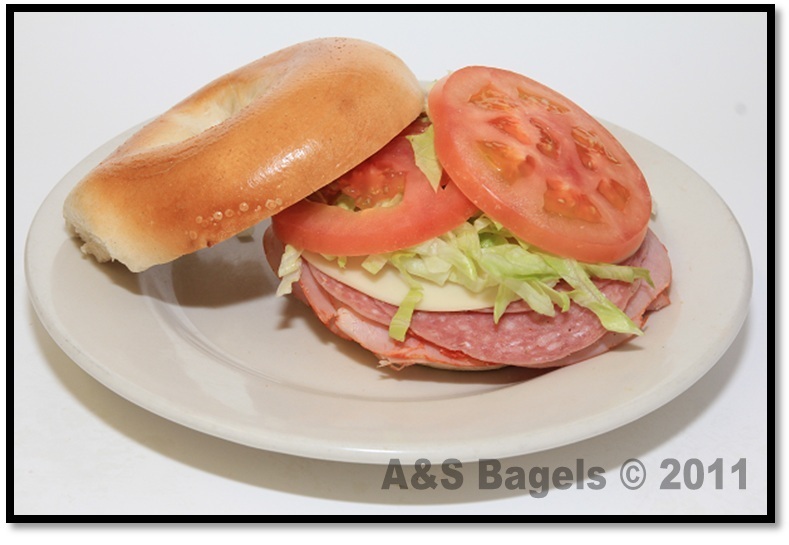 The A&S Bagels retail store is located at 761 Hempstead Turnpike, Franklin Square, New York. The wholesale operation of the business includes delivering bagels to supermarkets, delis, hotels, catering halls, bagel stores, bakeries and food distributors. 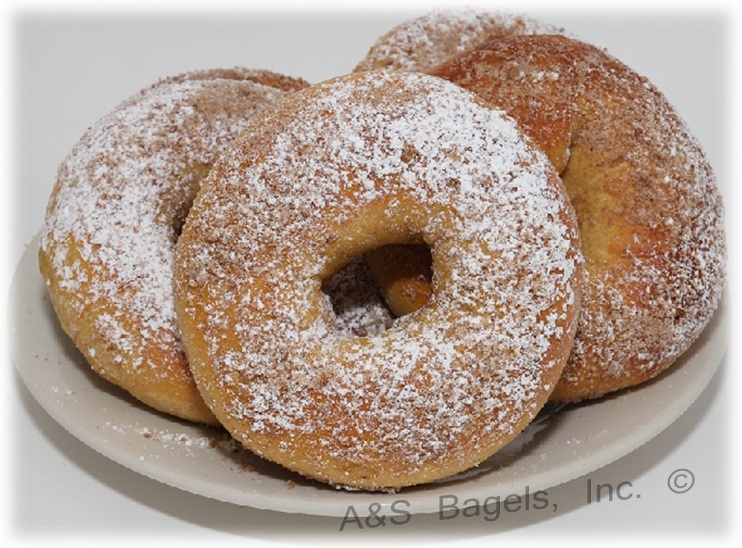 Bagel Delivery (Commercial, Bulk, Large Orders): A&S Bagels sells our bagels in large quantities at reduced prices to other bagel stores, bakeries, hotels and other food service institutions. Your deli, bagel store, food distribution business can re-sell A&S Bagels. If you are interested in purchasing bagels from A&S Bagels, please contact A&S Bagels at (516)326-9288. 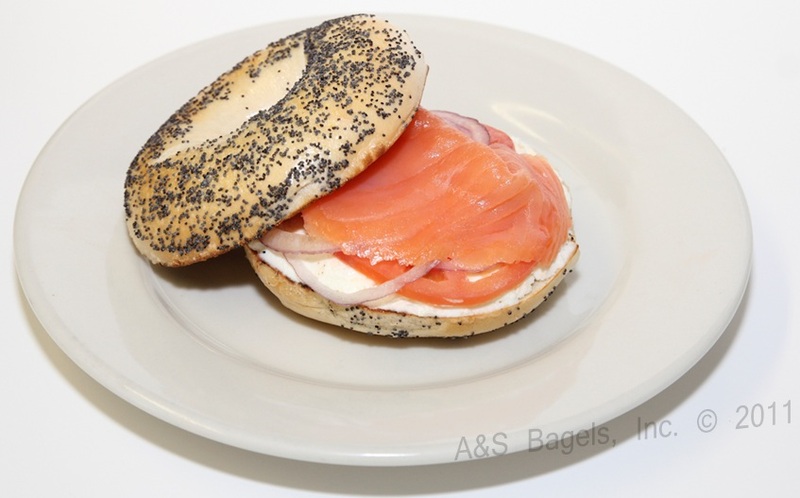 Daily Delivery of A&S Bagels: A&S Bagels can arrange for Daily delivery service to LONG ISLAND and NEW YORK CITY METRO AREA bagel shops, delis, bakeries, catering halls, schools, hotels and other food service institutions. 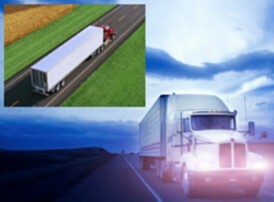 Weekly, Bi-Weekly, Monthly Delivery of A&S Bagels: Weekly, Bi-Weekly, Monthly delivery service of A&S Bagels is available for most bagel stores and food distributors in the continental USA. We can arrange for shipment (by the pallet) of our Frozen Raw Dough Bagels, Frozen Fully Cooked Bagels, and Frozen Par-Baked Bagels to most areas in the continental USA. Online Orders (Mail Order): If you are interested in small quantities (1 to 5 Dozen) to be delivered to locations outside of the NYC and Long Island area, you should try http://www.bestnewyorkbagel.com/. BestNewYorkBagel.com is not owned and is not managed by A&S Bagels, and BestNewYorkBagel.com is not a subsidiary and is not an affiliate of A&S Bagels. Pictured above is a Party Bagel filled with cold cuts from A&S Bagels. The Party Bagel is a favorite for get-togethers and parties. 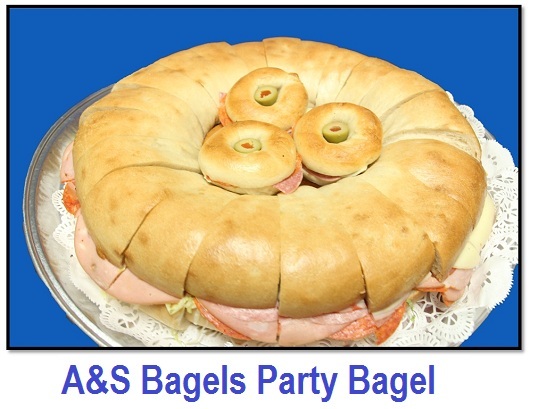 For more catering choices offered by A&S Bagels, including heroes, mini bagel platters, and danish platters, please download and print out our Catering Menu. A&S Bagels is located in Franklin Square, New York. A&S Bagels is a retail and wholesale bagel bakery, and is open 24 hours a day, 7 days a week.